"Listen to Steve Wright In The Afternoon. Viewed from a certain angle the man is a genius. Find that angle and view. He is the most popular DJ in the country. He has been the heartbeat of the British psyche since 1985. You don't even have to like him to be awed by him. This... is not an attempt at obvious irony, it is for real." Bill Drummond and Jimmy Cauty - "The Manual - How to Have a Number One the Easy Way"
Over the years, the above paragraph from the KLF's guide to making number one hits has troubled me. Once they've mentioned Steve Wright in relation to their summer smash "Doctorin' The Tardis", some parallels become very clear - Wrighty even used comedy dalek voices on his show, though noticeably after Drummond and Cauty used them first (and after Victor Lewis Smith, for that matter). One person who has suggested that Steve Wright might actually be more of a subversive than you'd expect is Richard Easter, his radio sidekick for many years, who was responsible for a vast number of the comedy characters and musical sketches which littered his Radio One show. Easter's work-rate was actually phenomenal. Whereas most comedy writers will tend to focus their efforts on material for a couple of radio or television series a year, he rapidly contributed a lot of work to Wright's radio show five days a week, continually bearing the broad Radio One audience in mind. As such, it's not surprising that characters like Dr. Fish Filliter or Arnie Terminator's angry consumer complaints aren't necessarily award-winning or groundbreaking material, but all were short, sharp, absurd, almost always utterly silly and occasionally unexpectedly close to the (fish) bone. As comedic contributions to a mainstream radio show go, they were far more successful than most attempts at the time, and helped to keep Wright's ratings buoyant and people like me listening. 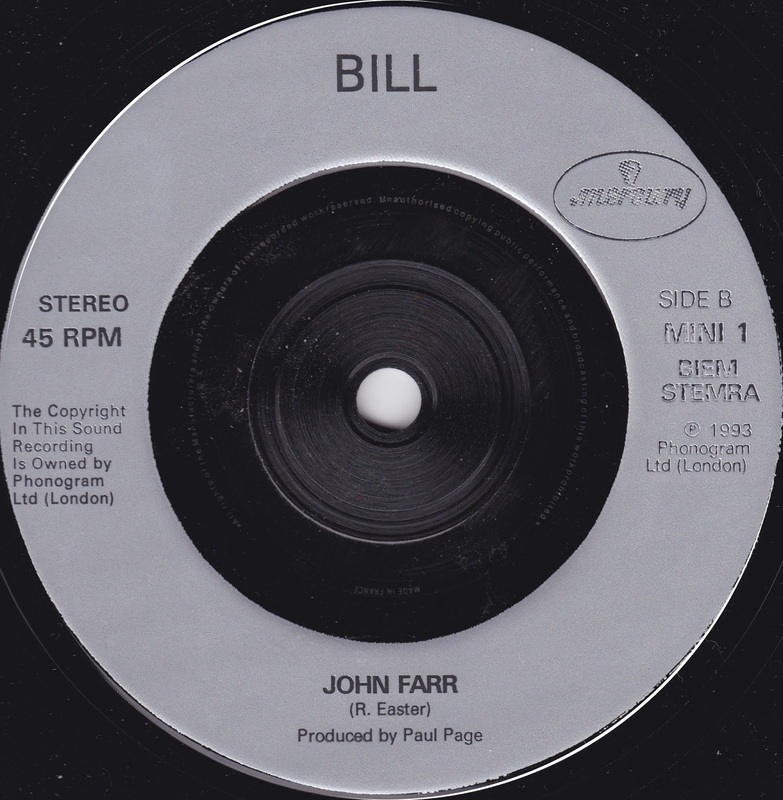 Easter was also a keen writer of catchy novelty ditties, which saw him score a bona-fide major hit through Epic Records with Arnee and the Terminators "I'll Be Back" (penned in two hours and apparently never intended for commercial release, though it seems to have inadvertently invented the sound of Scooter). Doubtless other major labels were keen to capture the lightning success of that unlikely hit, and Mercury obviously felt his satirical melodic musings on the tedium of car boot sales - repeated at extremely regular intervals throughout Steve Wright's show - would be the next top ten smash in line. 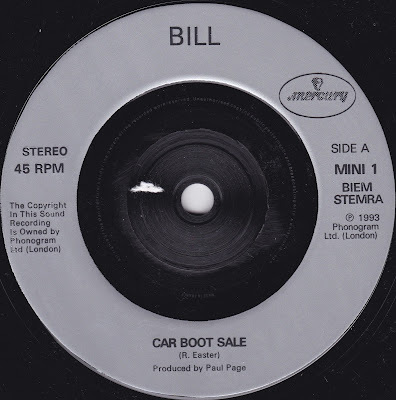 With vocals delivered by Easter's local pub landlord, who also played the "Easy Life" character, "Car Boot Sale" is a very peculiar thing indeed for a major label to release. 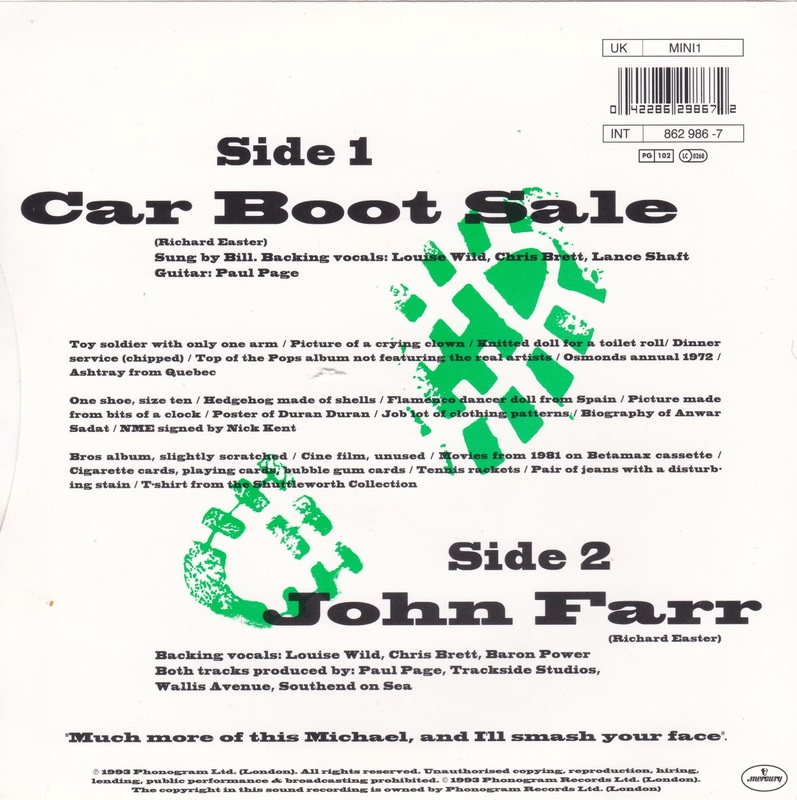 Repetitive and filled with sarcastic barely-in-tune fanfares and deliberately underpowered nightclub rhythms, it continually sounds in danger of giving up the ghost before somehow finding the strength to continue its despairing observations. 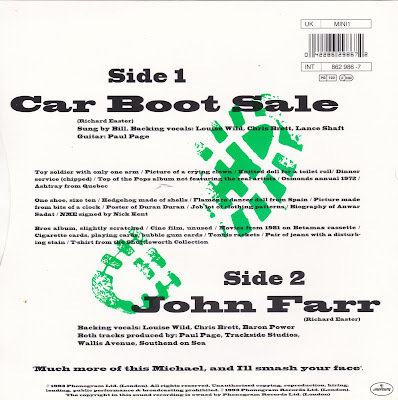 It's one of the only novelty singles I can think of which makes a feature of being utterly depressed at the mundanity of cheapskate modern life, making it seem closer to Half Man Half Biscuit than the KLF in style - it's the sound of a man clawing his way across a desert landscape filled with abandoned cars overflowing with old Bros LPs but no water whatsoever. Perhaps inevitably, it peaked at Number 73 in the charts for one week before disappearing forever, with not even Mercury Records' marketing might and the benefit of regular plays on national breakfast radio being enough to create a hit. All's well that ends well, though. Easter continued to produce popular comedic inserts for Steve Wright, and eventually moved on to become a successful television script writer and author. 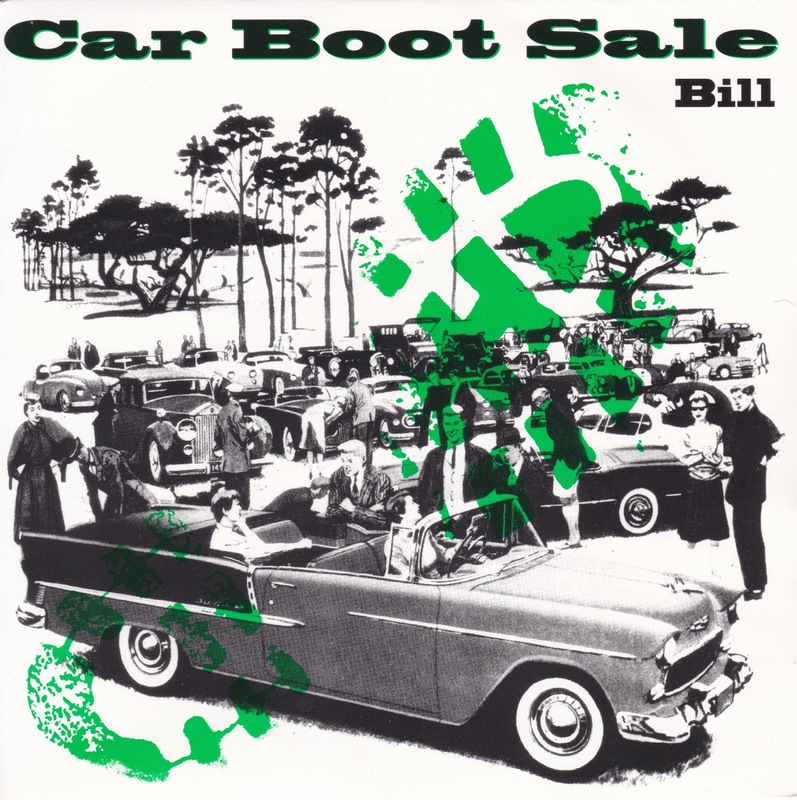 And car boot sales still remain much the same wherever you go, with "Top of the Pops" albums always being present, but never those test pressings of sixties albums you always read about about other people discovering. 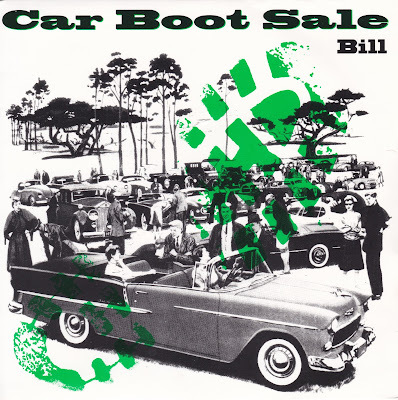 The most interesting item at the last one I went to was a John Inman album which turned out to be too scratched to be worth bothering with. You may, of course, have been blessed with better fortune.